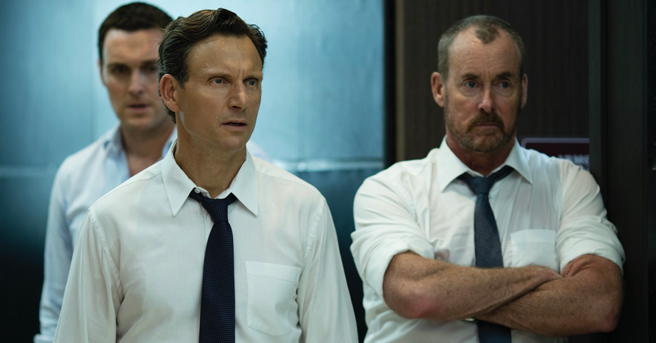 John’s Horror Corner: The Belko Experiment (2016), Office Space with a chunky slathering of Texas Chainsaw Massacre gore. MY CALL: A brutal horror film driven more by characters than gory backseat shock tactics. But make no mistake, the brutal gore is there, too. 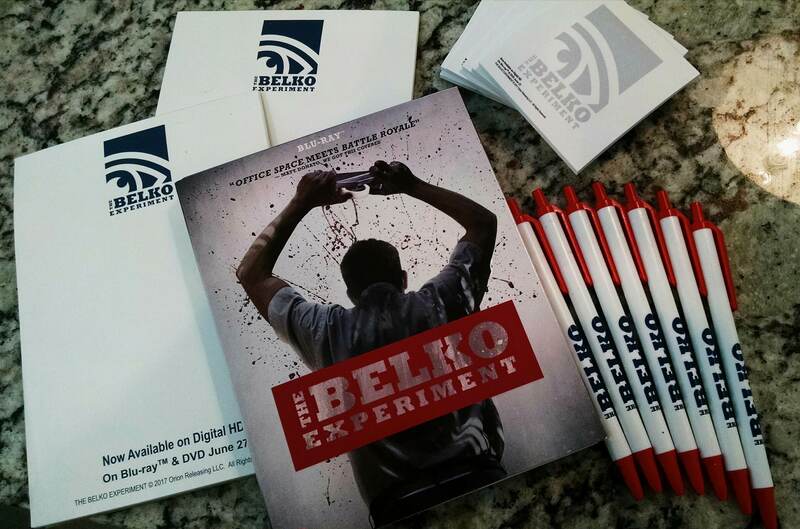 MORE MOVIES LIKE The Belko Experiment: Some reviewers have compared this to the likes of Would You Rather (2012), Cheap Thrills (2013), 13 Sins (2014) or Battle Royale (2000). Sure, there are similarities, but I largely disagree. 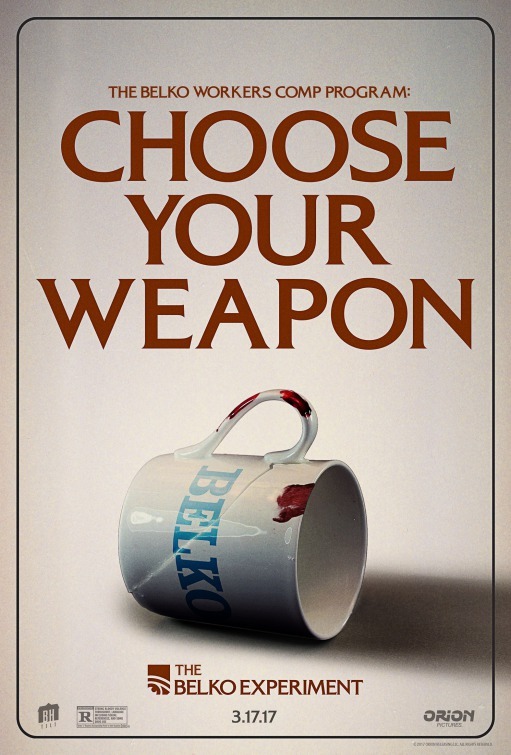 Fans of Belko should instead turn to the mania-driven films The Mist (2007) or The Experiment (2010). Disclaimer: This blu-ray was sent to me by a publicist from FOX along with some free Belko paraphernalia gifts in hopes that I would review the movie—probably to rally interest for the DVD release. However, I was not paid to write this nor were there any conditions to my receiving this package. Clearly demonstrative of the low corporate overhead of running an overseas business, opening shots of Bogota, Colombia’s city streets introduce us to some of our office drones much in the same fashion as did Office Space (1999). Our displaced Americans work for a non-profit company specializing in—again, ironically to the tune of Office Space—facilitating the hiring of American personnel to overseas businesses; an outsourced company specializing in facilitating outsourcing personnel. Now I’m not sure if it’s my age or the fact that I love The Replacements (2000) that I even noticed this, but the irony continues to rain down thick as our Belko employees stroll into work and the scene is scored by a Spanish language rendition of “I Will Survive.” LOL. Way to set the mood as our smiling office workers arrive to their daily grind. 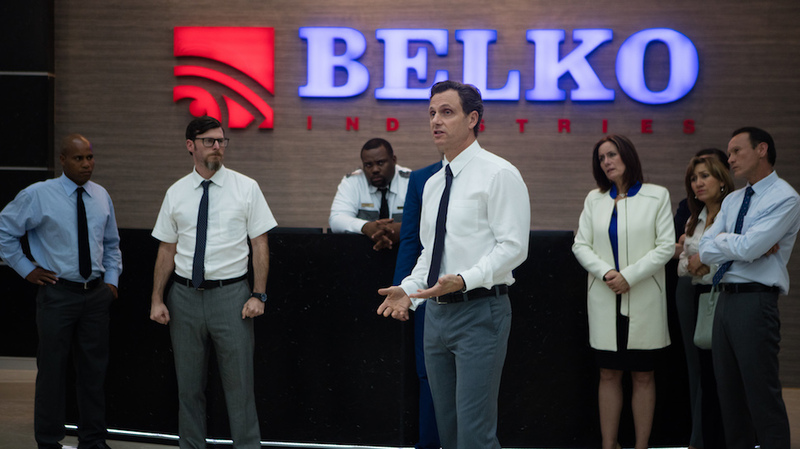 But quite contrary to the drab cubicle Hell of Office Space, Belko boasts a gorgeously manicured corporate-chic environment, rich with all the corporate perk trim. The work day begins with some banterous levity from Mike (John Gallagher Jr.; Hush, 10 Cloverfield Lane), evading overzealous oversharer’s family vacation photo assaults, pleasant office friends naming their ant farm ants, a bit of flirting, and playful relationship gossip. Among the staff we find the boss Barry (Tony Goldwyn; Ghost, The Last House on the Left), Leandra (Adria Arjona; True Detective, Pacific Rim: Uprising), Bud (Michael Rooker; The Walking Dead, Slither), the pot-smoking rationalist Marty (Sean Gunn; Guardians of the Galaxy Vols. 1-2, Tromeo and Juliet), and Office Space’s own Wendell (John C. McGinley; Stan Against Evil, Identity). Everyone seems happy to be there and the tone of the film is expertly cast before pulling the carpet out from under us. But the fun and games come to an end when the building seals everyone inside of a steel trap and an announcement prompts that if two people are not dead in 30 minutes, there will be “repercussions.” Some remain of rational mind and humane heart, others not so much. As things get dire, morals tend to degenerate, don’t they? Just as we saw in The Mist (2007). Like a murderously flowered spring meadow on a windy day, undesirable personality traits pollinate mass hysteria. Most of the effects are well-executed, abruptly brutal blood splatters. 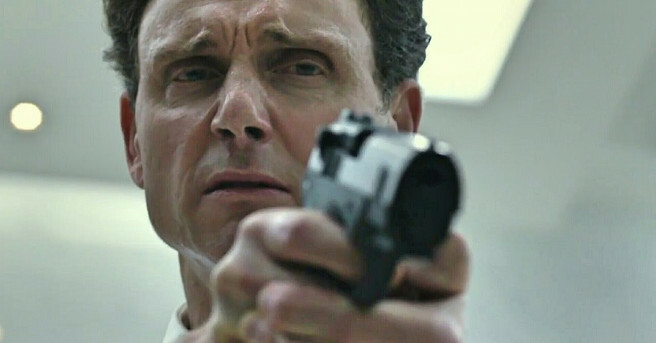 But we also enjoy a fair share of skull-crushing, face-collapsing scenes. You know, some awesomely “Chainsaw Massacre slaughterhouse” chunky gore. The gore is visceral, and the atmosphere makes us feel it unrelentingly harder. Director Greg McLean (Rogue, Wolf Creek 1-2, The Darkness) and writer James Gunn (Slither, Guardians of the Galaxy Vols. 1-2) kindly paved our character introductions with a sort of daily humanity. After all, we don’t want to see anything bad happen to the guy who named an ant farm ant to make his co-worker laugh. We meet a staff of nice people… but they don’t stay nice. Fear breeds desperation—and incentive. I actually understand why this didn’t rock the box office. It’s not that kind of film. But it’s a good one, worthy of your attention; worthy of a lot of attention. McLean and Gunn are attentive to their characters, and it is their characters—and not their death scenes or the hunt—that make this film work. But, oooooooh, that chunky gore is just the icing on this fleshy cake. Truly riveting! Finally a new story that hasn’t been told.